Facsimile New York edition, 1880. 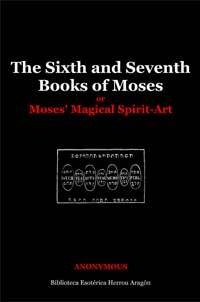 The Sixth and Seventh Books of Moses is an 18th- or 19th-century magical text allegedly written by Moses, and passed down as hidden (or lost) books of the Five Books of Moses or Pentateuch. A grimoire, a text of magical incantations and seals, it purports to instruct the reader in the spells used to create the miracles portrayed in the Judaeo-Christian Bible. The work was printed with annexes or reputed Talmudic magic names, words and incantation, many taken from Christian biblical passages. It shows diagrams of "Seals": magical drawings accompanied by incantations intended to perform various tasks, from controlling weather or people to contacting the dead or Christian religious figures. 190 pages, 16 x 24 cm. Sixth Book of Moses: The Mystery of the First Seal. The Mystery of the Second Seal. The Mystery of the Third Seal. The Mystery of the Fourth Seal. The Mystery of the Fifth Seal. The Mystery of the Sixth Seal. The Mystery of the Seventh Seal. Seventh Book of Moses: The First Table of the Spirits of the Air. The Second Table of the Spirits of Fire. The Third Table of the Spirits of Water. The Fourth Table of the Spirits of the Earth. The Fifth Table of Saturn. The Sixth Table of Jupiter. The Seventh Table of Mars. The Eighth Table of the Sun. The Ninth Table of Venus. The Tenth Table of Mercury. The Eleventh Table of the Spirits. The Twelfth Table of the Schemhamforasch. The Magic of the Israelites. Formulas of the Magical Kabala of the Sixth and Seventh Books of Moses. Extract From The True Clavicula Of Solomon And Of The Girdle Of Aaron. Biblia Arcana Magica Alexander, According To The Tradition Of The Sixth And Seventh Books Of Moses, Besides Magical Laws. Citation of the Seven Great Princes in The Tradition Of The Sixth And Seventh Books Of Moses. Semiphoras and Schemhamphoras King Solomon. Astrological influence upon man and magical cures of the Old Hebrews.